Traded in for a Fusion Sport! After an awesome first summer with my EcoBoost Mustang, I’m in love! The car is outstanding stock, but of course I had to mod it a little. I focused on addressing some suspension work and a Cobb tune. Cobb, notoriously conservative, shows multiple dynos with the 4 cylinder turbo, direct injected, 2.3L turning 285 WHP and a massive 390 fl-lbs of torque! Not too shabby. Stella feels amazing on and off the track. I did want to occasionally track her. The S550 new Mustang chassis is incredible. Granted, the EcoBoost is the lightest Mustang now, but it’s still portly at about 3550 lbs for my Performance Pack model with no options. While Smurfette, my 2014 Ford Focus with a manual was an excellent car, I couldn’t live with a non-performance daily driver. Granted, I’m insane. However, I needed a every day car that suited my personality and lifestyle. 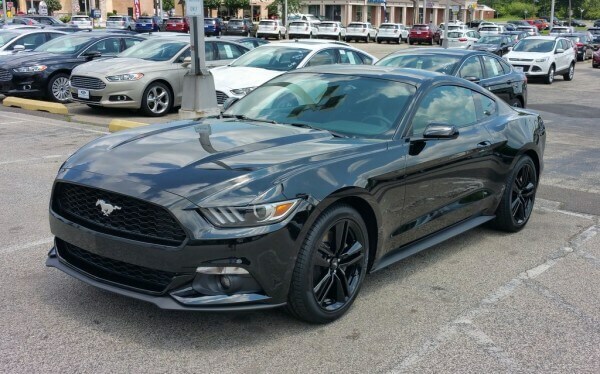 Thus, Smurfette was traded in for Stella, my 2015 EcoBoost Mustang in black on black on black – that’s a lot of black! Black paint, interior, and wheels. I have no plans for anything crazy like Inferno Mustang, my track dedicated 2011 GT with a Roush blower and a serious attitude problem. Regardless, Stella is no slouch. Bone stock, the EcoBoost Mustang lays down 310 HP and 320 fl-lbs of torque at the crank. With the Cobb tuner’s help, the otherwise stock power plant pushes some excellent numbers, especially in torque. I will be adding a lot more details soon, but in general, the EcoBoost Mustang is the performance bargain of the decade. Go buy one! Seriously, go buy one. You can’t get a better car for under $30K, unless you must have seating in the back. The only car that comes close in value is the 2015 plus Subaru WRX. I have a totally custom STi. Much more coming soon, including a full review!